In her dance-theater work "The Master," Vanessa Voskuil evoked zen serenity and cosmic uncertainty with a surge of movement that can only be described as speaking in gestural tongues. Like the set that she and her fellow performers demolished in the finale, Voskuil dismantled herself and illuminated all the working parts. She gave an intensely focused performance, simultaneously invoking ingénue and crone, trickster and guru. Moving to a highly philosophical and at times mordantly funny taped text about (among many other things) the relationship between performer and audience, Voskuil summoned up the mad woman in the attic by way of Mozart's "Queen of the Night." Performance art–oriented artists and groups like... Vanessa Voskuil... create richly evocative, surreal landscapes, often in alternative spaces. 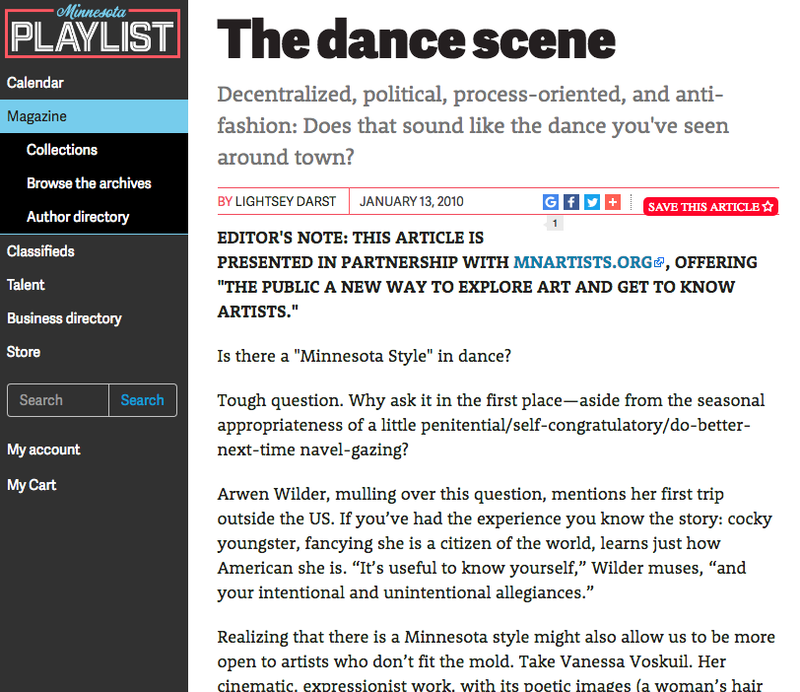 ....Realizing that there is a Minnesota style might also allow us to be more open to artists who don’t fit the mold. Take Vanessa Voskuil. Her cinematic, expressionist work, with its poetic images (a woman’s hair pinned to a winter-ridden tree) and its universalist themes (the self and the world, love, the mass and the individual, bravery) was too lovely and apolitical for the po-mo crowd to grab onto, but not dancey enough for the modern scene to adopt it either. The result? Voskuil had to wait so long for her Momentum: New Dance Works show that, by the time it finally arrived last summer, there was nothing "emerging" about her work. In fact, Voskuil was so discouraged, she nearly called it quits a few times before her Momentum. Who knows what else we’ve lost over the years—whether through a lack of understanding or a failure to explore the question we didn’t even know to ask? A bird’s-eye view every so often might be salutary....Watch for Voskuil’s spreading influence. With the award-winning Live Action Set, Voskuil honed a poetic, engaging form of dance theater. Now she’s won a McKnight Fellowship and set about defining a new sub-genre—dance designed for film, complete with close-ups, abstraction, and new narrative ideas—and is curating a show of films blending the mediums. “I was overwhelmed by the possibilities at first,” she says of dance on film. “It makes dance accessible in a whole new way.” Dance Film Project screens December 17 and 18, Southern Theater, southerntheater.org. Consummate solo dancer Isadora Duncan wrote, "When I have danced, I have tried always to be the Chorus. ...I have never once danced a solo." Last July, the 69 performers in Vanessa Voskuil's En Masse demonstrated how a chorus can function as a single, multidimensional dancer. Not that these ethnically, gender-, and age-diverse folks—none of them professional dancers—ever displayed the kind of well-oiled unison of, say, the Rockettes. Rather, they moved with the inexorable liquidity and purpose of some giant, pliant organism. At one point several dancers were seamlessly lifted above the group—first just a head higher, then way up, surfing the crowd like benign porpoises while remaining part of its tidal flow. Sometimes the surging mass verged on ecstasy and its handmaiden, anarchy. As the performers jogged, swayed, milled restlessly, posed seductively, huddled, and embraced, they embodied a shifting dynamism, an unfolding of forces and temperaments, and a unity of purpose that defines the greatest dancers. It takes a village to make…a dance community. And it takes a dance community (among other things) to make a village worth living in. Monday night, September 21, the Southern Theater hosted a panel discussion with the three choreographers who have most recently been awarded McKnight Fellowships for creating dance. It was a comfortable, well-paced, interesting and largely unscripted evening worth every minute. The three choreographers were (in alphabetical order) Emily Johnson, Morgan Thorson and Vanessa Voskuil. Each had a chance to say a few words then five minutes or less of material was shown by video. "This work is about human development and the metaphor of the garden is ideal for this topic. It is about nature and what is means to be a part of the world...Our growth is of our own doing and in this structuring of this work, I considered all aspects of individual growth...Our process dealt similarly with our life processes and, internally, how they relate to our 'truest self'...Each piece of this 'garden' (human soul) is equally unique to other 'gardens' (human souls), she explained. After a two-year exploration, director and dance maker Vanessa Voskuil presents the culmination of her large-scale dance- and music-theater piece, The Student, this weekend at O'Shaughnessy Auditorium as part St. Catherine University's Women of Substance series. Premiering on Thursday, the work features about 70 local dancers, actors, and community members, plus 100 student vocalists from St. Catherine University, Hamline University, and Perpich Center for the Arts Education. . .
With a generous effort to articulate a deep spiritual understanding, Vanessa Voskuil knows how to invite the audience in to her latest work, The Student. As the curtain rises on an empty stage, we hear a series of uncanny whooshing sounds, as if the enormous unseen circulatory system of the work is whirring itself to life. Solemn figures enter the auditorium from the outside, proceeding down the aisles to envelop the audience on either side, lit with hard back light, and slowly walking backwards toward the stage. It has bracingly and disarmingly begun. To approach this work, the uninitiated should first understand that Voskuil’s work boldly and uncompromisingly moves within its own time and its own logic, and she works unapologetically on her own terms. But without being didactic, pretentious or overbearing, she gently summons the viewer into this distinctive space, where the air feels different, time and sound slow down and perception shifts, and thus the stage is set for a truly singular expression. The intermission after Myers’s work stretches long; people shift in their seats. Then, without the house lights going down, the curtain starts up, slowly, revealing no one and nothing, the stage bare to the back and sides, black, exposed. Still nothing. But we know the dancers will come. People turn around. The inevitable crying baby bursts out; by the laughter I measure our tension. The air’s alive, as if stirred by an invisible cast of thousands. Yellow-orange light drives down on us. Then the dancers appear at the doors, backing down the aisles, upright, dressed in ash- and clay-colors. They move slowly. My first thought: this is going to take forever. But then I find myself caught by the audience’s behavior: some turn all the way around and some stay facing front, waiting. The dance is a litmus test for us. "[en masse]...fascinating....can't stay unmoved....there's no denying the charisma of the crowd. A group this large is magic; there's no looking away." "[en masse]...like a giant organism seeking a higher purpose"
"[en masse]...humanity at its worst...and its best...Voskuil clearly has a way with such a large group. There wasn’t anything innately innovative, provocative or genre-shattering about the work, but "en masse" left one with faith in one’s own and other’s humanity — and a desire to join in Voskuil’s vision on stage." mnartists.org: Post Show Review: Vanessa Voskuil "en masse"
“…I was in another world [the silents: for Derive]. ….Meaning? If you can’t state one, you won’t miss it. In Voskuil’s work, image leads sense."